Since 2014 ANP has been implementing the project “Dealing with the Past in Kosovo” jointly with its partner organization KURVE Wustrow and funded by the German Ministry for Economic Cooperation and Development BMZ. Currently, ANP is working with the third group of Participants until the end of 2018. The new cycle of the project will start in 2019 and be continued until 2021, which means ANP will be able to work at least with two further groups in the project. Public discussion in Kosovo society is marked by silence or ethnocentric narratives when addressing the violent times beginning in 1989, accumulating in the war of 1999 and ending in the violent outburst 2004. As of today the number of Missing Persons is about 1,700, which places a heavy burden on reconciliation processes. Action for Nonviolence and Peacebuilding (ANP) is working jointly with KURVE Wustrow for a change in the culture of remembrance. People from all over Kosovo get empowered to share their stories and to present them to a wider public. In October 2014, 16 participants from diverse ethnic communities from Kosovo, started for the first time a joint process in Ulqin/Ulcinj, Montenegro to share their life stories and to hear what happened to members of other communities. The mutual understanding and recognizing of suffering and pain is a process full of empathy, which reduces prejudices and prevents from easy judgments. ANP successfully created the safe space where the participants could open up and speak freely about the hard time they went through. Until today, ANP created this safe space for three groups, each of 16 participants from all ethnic communities in Kosovo, and has continuously conducted a lot of activities in the field of dealing with the past. Art is a good form for expressing difficult feelings and mixed emotions. The participants started to paint pictures about their life sufferings in the past and the difficulties, challenges and losses they had to face. The pictures are full of expression, strength and offer a deep view inside the hearts and minds of their authors. 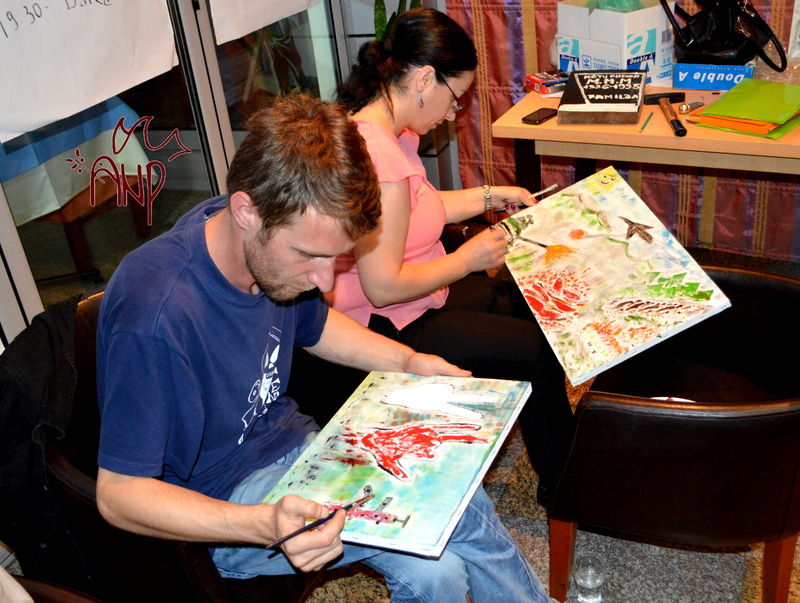 The art that is made by the participants of the three participating groups during the trainings, was related to their life stories, and were organized three exhibitions (one exhibition for each group) at the National Library of Pristina. A lot of curious visitors had the chance to see the pictures and to discuss with the participants and ANP team about this Dealing with the Past approach. In addition to the paintings the participants started to write or prepare their life stories with the help of ANP trainers. This process is initiated in the first training session with each group and intensified in the following months and years. The first period of the project “Dealing with the Past in Kosovo” was finished at the end of 2015 with a publication containing all the personal life stories of the participants. During the 2016-2017 ANP in close cooperation with the second training group has produced two documentaries that includes most of the participants and their Life stories. At the moment ANP is preparing the second book publication. Further stories will be shared here. To support the demanding and painful process of remembering the darkest time in their lives, ANP conducts trainings for Stress Management and Resilience, normally at the end of the second training phase with the each group. Furthermore the ANP team acted as mentors and stayed in close contact with the participants to give support and relief during their writing. During the course of the project, trustful and strong relationships have been built up among the participants, as well as between them and the ANP trainer team.